Mega Sena might be a bigger, more widely-regarded lottery in Brazil, but the Brazil Quina is no slouch, either. While a smaller lottery game in comparison, there is still a lot to like here. It’s an easy-to-learn, rollover lottery that offers tax-free prizes paid out in lump sum form. There’s several things that might raise an eyebrow though—but Brazil Quina offers counter measures that might soften the blow. What exactly am I talking about? Find out below as I take a closer look! Brazil Quina was added to Caixa Loterias’ roster of games back in March 1994—along with Mega Sena—in the hopes of introducing a lottery game wherein players could pick their own numbers. At the time, Brazil’s lotto industry was predominantly made up of raffle-style games. Since its inception, the Brazil Quina has remained largely the same—at least until October 5, 2009. It was on that year when big changes were introduced, which increased the frequency of draws to six times a week—every Monday through Saturday. This move made Brazil Quina into what it is today: one of Caixa Loterias’ most popular games. Almost Daily Draws: Brazil Quina draws are held from Mondays to Saturdays—which means you have 6 chances to win each week. Jackpots Carry Over: Brazil Quina jackpots rollover to the next draw in the event no one wins the current draw. Minimum Jackpot: Speaking of jackpots, at least R$500,000 await top prize winners. Not the Best Odds: Compared to other mid-range lotteries, Brazil Quina doesn’t offer the best odds. Increase Chances: While they may not have the best odds to start with, Brazil Quina allows you to play six or seven numbers instead of the default five—which should increase your odds of winning. Only Four Tiers: You can only win in four prize tiers here. Tax-Free Prizes: All Brazil Quina prizes are 100% tax-free at the source. How Does Brazil Quina Work? Unlike a lot of lotteries, Brazil Quina doesn’t operate on the traditional 6/49 or 6/45 game formats. Instead, its utilizes a 5/80 mechanic—which means you would have to pick five numbers from a selection range of 1 to 80. Matching all five numbers means you win the jackpot. In total, Brazil Quina features 4 prize tiers—where you must match at least 2 numbers in order to win a prize. Except for Sundays and bank holidays, the Brazil Quina holds draws every day of the week. That means you have six chances to win every week. As if that wasn’t enough, during the summer there is the Quina de Sao Joao Super Draw. This special, limited-time draw—held on June 24th of every year—offers the chance to win some impressive jackpot prizes. It should be noted that the Quina de Sao Joao jackpot doesn’t rollover if there are no top prize winners. In comparison, California Fantasy 5—which also has four prize tiers—offers a 1 in 575,757 chance of winning the top prize. That game also requires you to match 5 numbers to win the jackpot. The culprit here is Brazil Quina’s large guess range. California Fantasy 5 asks you to pick five numbers from a total of 39, while Brazil Quina asks you to pick from 80. As I’ve discussed in another article, part of the equation that determines the odds of winning is how small or large the selection pool is. The larger the pool, the longer the odds will be. That said, Brazil Quina offers a way to increase your chances of winning. Instead of just playing the default 5 numbers, you can also choose to play 6 or 7 numbers, instead. For an added cost, of course. So, if you play 6 numbers, your odds of winning the jackpot improves by a bit—specifically, 1 in 4,006,669. Meanwhile, if you play 7 numbers, you will have a 1 in 1,114,762 chance of hitting the jackpot. If you win in the Brazil Quina, there are some guidelines you need to be aware of. For winnings R$1,787.77 or less, you can simply go to any shop authorized by Caixa Loterias to claim your prize—or you can simply go to any Caixa Economica Federal (or CEF) branch. Meanwhile, for prizes beyond R$1,787.77, you can only claim your winnings at any CEF branch. Finally, if you were lucky enough to have won R$10,000 or more, you still have to go to a Caixa Economica Federal bank—but you would have to wait two days after making a winning claim. Also take note that all Brazil Quina winnings are paid out in lump sum form, so don’t go looking for an annuity option. More interestingly, winnings are 100% tax-free at the sources. Technically speaking, however, Brazil still imposes a tax—just not on you. How? It’s simple: tax deductions are made prior to publishing the jackpot amount. This way, you still get the advertised amount sans withholdings. Proceeds from Brazil Quina ticket sales go to worthwhile causes—specifically in areas such as arts, culture, education, sports, and public safety. Unclaimed prizes are likewise donated to help good causes. In this case, the beneficiary is the Fund for Student Financing of Higher Education. Around 20% of revenue from Brazil Quina ticket sales are added to the prize fund, while around 33% go to various government institutions. The remainder, some 5%, is used for maintenance. With draws almost every day of the week and uncapped jackpots, how can you pass up playing Brazil Quina? 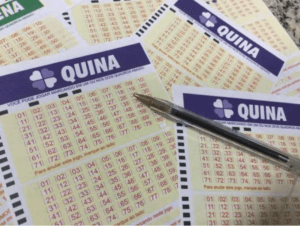 Brazil Quina offers lottery loves a lot to chew on: draws are held six times a week, rollover mechanics are in place, and prizes are tax-free and paid out in cash. The minimum guaranteed jackpot isn’t that big though, but the fact that rollovers are uncapped means prizes can grow to impressive amounts. The odds, meanwhile, aren’t that great to start with, but Brazil Quina allows you to increase your chances by simply playing 1 or 2 more numbers. It’s not a perfect lottery game—but it offers just enough to make it worth your while.